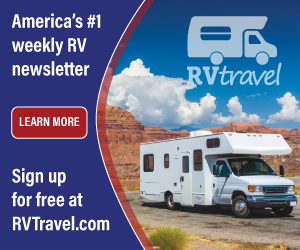 I am contemplating replacing my built-in microwave oven in my 34-foot motorhome. The current one does not have a turntable. I want to replace it with one that does have a turntable. My question is, will an over the counter tabletop microwave work without using special venting? I don’t recall seeing special venting on the one I have now. 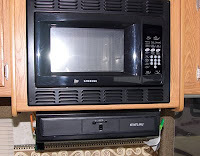 John, any standard 120-volt, 60 cycle, household-type microwave oven should work fine in the motorhome. Check the installation guide that comes with the new unit to be sure, but I'm not aware of any special exterior venting that would be required. The trickiest part, however, is finding a way to secure it safely. You certainly do not want it becoming a launched missile of sorts each time you make a wide turn or come to a quick stop. Simple "L" brackets secured to the sides of the microwave and the bottom of the cabinet work in most instances. I’ve seen them secured with a trim kit that is easily fabricated if your new microwave does not have that as an option. If you have any doubts about the installation though, take it to a professional shop.